Many new watercolor painters experience sticker shock when they go to purchase their supplies. Paper, paint, brushes, palette….etc. etc. etc…it’s overwhelming! It’s natural to look for deals, coupons, and cheaper products. However, paint is one of the supplies that impacts the quality of your painting the most. I’m always sad when I see people discouraged or give up because they’re unsatisfied with their work and it’s not because of their skills or talent, it’s because of their materials. So let’s take a look at the most common paint dilemma – Winsor & Newton Cotman or professional quality paint like Winsor & Newton Professional Watercolors and Daniel Smith Extra Fine Watercolors. The quality of paint depends on the ratio of pigment to binder and the quality of the pigment itself. Most student grade paints, colored pencils, and pastels have more binder (wax, Gum Arabic, etc.) than the professional products, which create less vibrant works. Cotman watercolor paint is no exception. As you can see, the Cotman paint is lighter and less vibrant. There is visibly less pigment in the paint. The tomatoes in the example on the right were painted with the exact same colors (Cadmium Yellow, Cadmium Red, Ultramarine Blue, Viridian or Phthalo Green, and Burnt Umber). I also used the same amount of paint, same amount of washes, and same techniques. The Cotman paint is more difficult to control and the vibrancy of the paint does not even compare to the professional quality. 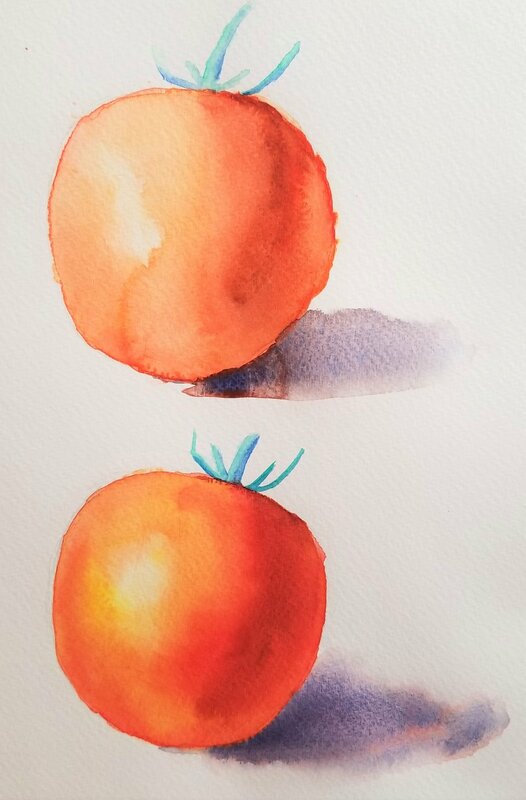 If this was your first painting and you got the result of the first tomato, you may be frustrated and give up, believing painting is too hard or you don’t have the skill, when it was really just the quality of paint that created the different results. Also, keep in mind that when you're beginning supplies are one investment that will last you a very long time. Brushes and palette will last you years. You can buy new paper after each painting is completed rather than in bulk. Paints will last through many paintings. Future purchases will be small and voluntary. Invest in your paints.